Our pricing model is like no other system available. 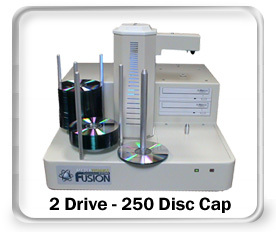 Our low purchase price allows any volume customers to provide their clients with CD ripping services. With your pay-per-use solution, when am I actually charged? Your account is charged when the CD is placed into the tray. You are billed at the end of every month using the credit card on file. No. If you don't use it, you don't pay for it. Are there costs for new versions? Currently, all releases are free. The pay-per-use model allows us to maintain free upgrades. Is there a charge for CDs not found? Our per-CD charge averages the costs associated with all the sources to simplify the billing process. Why do I need to supply DCS with the serial number of my changer? The serial number is used as the account code for billing purposes. Can I cancel a batch that has already been started? Yes, the software supports mid-batch cancellation. The current track is finished and the process is halted. All logging is completed and the cancellation is noted. What CD information sources do you use? Our approach is the more, the better. First, we query (All Media Guide, allmusic.com). If they don't have the CD's information, we try FreeDB.org. If they don't have the information, the CD's music is placed into an "Unknown ###" folder. What percent of CDs are found by RoboStation? RoboStation's hit rate is 98%. Often that missing 2% can be located by manually searching AMG's database and making the selection. After the music is converted, how do I load the media server? Now that the hard work is complete, you simply need to move the music. Most media servers have an import folder that is used. Each manufacturer is different, so refer to the manual. What steps are taken for certifying a media server? 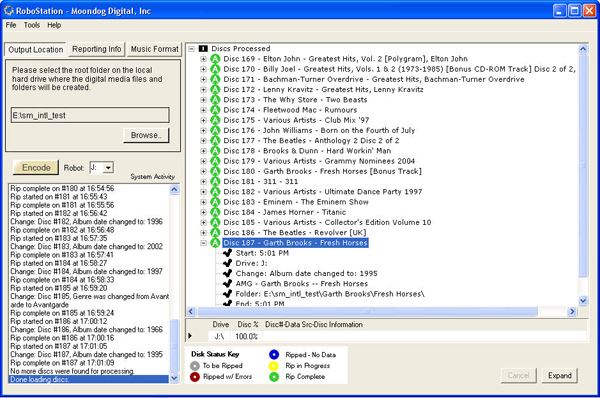 Our test library of CDs is processed and loaded onto the machine. We then inspect the collection to ensure the information is correct and used properly. Many times our solution is sent to the manufacturer and their quality assurance team certifies our product. What if the product I'm loading isn't listed on the Partner page or under Supported Products? We can't track every product that our solution loads. If the product supports standard encoding formats, it's probably been loaded by one of our customers. I have a robot that looks like this. Can I use it? You bet! Our software can control any branded version which includes the DupliQ, Baxter, Pico, and MiniCubis. What models from PowerFile do you support? Currently we support all PowerFile models. DCS has both the C200, R200, R200ROM, and R200DL (dual-layer) in-house and finds the R200 to perform about 50% faster than the C200. 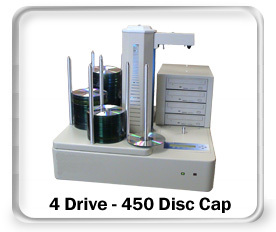 How many CDs can each system process? I ordered the Software + Hardware Bundle. How will everything be delivered? The RoboStation is made available to the customer via download. This is the most effective manner of distribution for a product such as ours. The equipment will be directly shipped to you. What software does it work with? Tests have confirmed that SlySoft AnyDVD, DVDDecrypter, and Handbrake can be utilized. Does RoboStation retrieve the DVD cover art? YES! We license DVD information from . Additionally, we supply an XML file of related DVD information. Here's a sample. What DVD systems has RoboStation loaded? We know that My Movies (www.MyMovies.dk), DVDLobby (www.cinemaronline.com), Calrad xLobby (www.xlobby.com), iMuse Electronics (www.imuse.us), Music Mountain (www.musicmountain.biz), Niveus Media (www.niveus.com), Vista Media Center have been loaded via RoboStation.